Your Apple Valley dentists can help to 'save your tooth' in a dental emergency! Occasionally, despite your best efforts to prevent a problem, a dental emergency will occur. 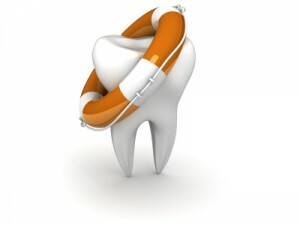 In summer, many times those dental emergencies are due to broken or knocked out teeth. If you accidently break or lose a tooth, it is important to contact your Dakota Dental family dentistry office immediately even if it is after hours. The Apple Valley dentist on call will help you determine if you need to be seen immediately or if a dental services appointment can be scheduled. Remember, the sooner you call and seek treatment, the greater the chance of saving a tooth. After dental emergencies, be sure to keep any pieces of the tooth that you can find. Dakota Dental advises you to not scrub the tooth or pieces of the tooth. Rather, handle them only by the chewing edge and place them in a cup and cover with whole milk or with saliva. (You may also place the tooth inside your lip or cheek if you will not swallow it.) To stop bleeding, place a piece of gauze on the gum and apply light pressure. A cold compress may also be placed outside the mouth near the broken tooth to lessen the swelling and pain. Unfortunately, not all teeth can be saved and reimplanted, despite your best efforts. The good news is that Dakota Dental’s Dr. Shelley Wakefield and Dr. Bennett Isabella are known for their cosmetic dentistry abilities. In fact, Dr. Wakefield is one of fewer than 100 dentists in Minnesota who have received a certificate for participation in a post-doctorate degree program in aesthetic dentistry at the University of Minnesota. From bonding to crowns to veneers to complete smile makeovers, your Apple Valley Dental Clinic has you covered. Whether you need restorative dental procedures, cosmetic dentistry, or general dental services, Dakota Dental is ready to help with any dental emergency.